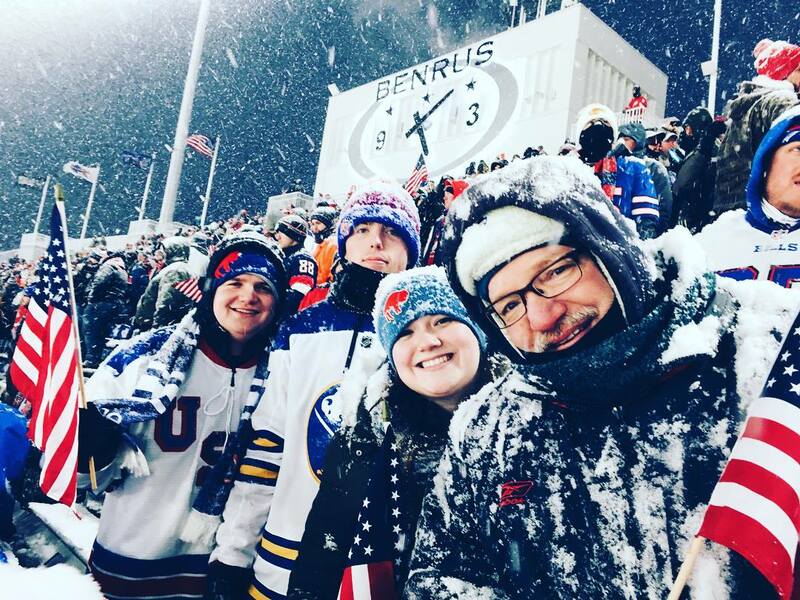 In a stadium half filled with distinct Canadian accents, I overheard the following comment: “It doesn’t snow like this during football games.” Obviously, that visitor wasn’t present just a few weeks earlier for the Blizzard Game against the Colts (see “Live from the 2017 Buffalo Bills Snow Bowl,” Mendon-Honeoye Falls-Lima Sentinel, December 14, 2017). This night, however, wasn’t a football game, it was a hockey game. And not just any regular hockey game, it was an outdoor game for the World Juniors Championship featuring the USA against Canada. Again, like the Blizzard Game, the snow didn’t start until we arrived at New Era Field. Also, the gusts weren’t as bad. This proved fortuitous, since, unlike our season tickets, our seats for this hockey game were located high in the upper deck. Without the whipping winds, the flakes fell in a soft flutter. Soon, there were a lot of them. Big wonderful Charlie Brown snowflakes. Lake Erie’s finest. We could still see the rink, but the snow quickly covered the various logos surrounding the ice. The maintenance crew had supersize leaf blowers to remove the white stuff. No sooner had they made one pass, though, then the accumulating snow had buried the logos again. By the middle of the second period, they gave up. The ice was another matter. Every eight minutes of playing time or so, the refs took advantage of a stop in play and sent the players to their respective benches. The plexiglass gate on the tunnel end of the field opened and in came a crew of a dozen toting supersized snow shovels. They also brought out wheel barrows and large garbage cans to collect the shoveled snow. That’s how fast (although, unlike the Blizzard Game, not furious) the snow was coming down. There was another difference between this late afternoon/early evening and the Blizzard Game: the temperature. It was in the single digits, and I was wearing four layers (including socks, pants, and shirts). This quadri-tiered clothing kept me warm. So much so I nestled comfortably into my bench seat, recalling fondly my own days playing pond hockey. Pond hockey. That’s true old-time hockey (you know the kind I’m talking about… Toe Blake, Dit Clapper, Eddie Shore, those guys were the greats). Back then we’d have to trudge through a foot and a half of snow down a thin trail to a pond deep in the woods. Snow shovels were just as important as hockey sticks and skates. We didn’t have pads, but we wore thick clothing to keep the winter cold as far away from us as possible. I remember this vividly. I wasn’t a good skater, so I usually played goalie – without a mask. After a couple stints, I learned newspapers made a great make-shift shin pads. And the added insulation kept my legs comfortable, too. See what I mean about old-time hockey? It was magic. It was fun. And it didn’t matter what the score was. So, as I sat back in my seat at the football stadium turned hockey arena, I couldn’t help but think if the young icemen below ever experienced old-time hockey. Did they play pond hockey? Or were they consigned to travel teams since their pre-school days? Do they know the friction effect snow covered ice has on a puck? Or do they only know the slickness of a Zamboni smooth surface? Have they ever gone into the winter night shirtless and in shorts? As the day turned into darkness and the white snow sparkled in reflection of the bright stadium lights against the night sky, the arena turned into a snow globe of winter wonder. That USA came back from a 3-1 deficit to defeat the Canadian team in a post-overtime shoot-out only added to the fairy-tale atmosphere. Some may complain the elements skewed the results, but the snow slowed to a stop in the third period and neither team possessed any inherent advantage. Unless they grew up playing pond hockey. I like hockey. I prefer outdoor hockey. And, in the ideal world, it’s always snowing when you’re playing hockey outside.